Where are missionaries supposed to be? Some argue that missionaries are to only be working with unreached people groups. I don’t think so. Undeniably… far more missionaries (Christians in general) need to to be where the gospel is proclaimed the least. But does that mean that these are the only places where missionaries should serve? In the early church missionaries worked outside of the church, but not strictly where there were no churches. I would like to suggest three places where missionaries should work. 1. Where the local church IS NOT. If there is no local group of believers who can reach out to the local population, then missionaries are needed… for awhile. 2. Where the local church HAS NOT. Sometimes there are local churches, yet they haven’t carried out an important part of their role. For example, many local churches only reach out to a certain social, racial, or economic demographic in an area while ignoring others. A missionary may be needed to open doors to areas the local church has been blind to, and to inspire them to take up the task. 3. Where the local church CANNOT. Some forms of ministry are outside of the skill set of the local church. These could include a radio ministry, Christian education, mission training, or medical care. A missionary may be needed to help the local church gain the material and skill assets to carry out this work. As you can see, all of these situations should be temporary. A missionary is needed where the church is not… until a 3-self (or 4-self) church is developed. A missionary is needed where the church has not… until the church is inspired and trained so that it is. A missionary is needed where the local church cannot… until it can. The problem comes when missionaries come in and set up churches where churches already are… or develop what the local church is already doing… or do what the local church already can. Part One of this topic pointed out that a major problem where regional churches have died (such as in North Africa and Central Asia) was due to a lack of enculturation. The church remained as a church of outsiders. In North Africa, the church was Roman, rather than North African. In Central Asia, the church was more a faith of the multicultural urbanites of the Silk Road, along with the traders along the route… but not the people of the land. On the other hand, the Thomasite church of India, the Abyssinian church of Ethiopia, and the Coptic church of Egypt survived, and even prospered in a hostile environment. But there is more than simply making cultural aspects of bringing the church into a region with language, rites, and theology that is resonant with the people. There is also the concern as to how far faith works itself into the hearts of individuals (and the people as a whole) in a region. In faith development, there is a tendency to seek a low level of affective response. Perhaps level 2 (responding) or level 3 (valuing) is good enough. Others may see the need for level 4. At level 4, people organize their lives around their faith. While that may be strong enough to enduring steady state conditions, it is not until one internalizes one’s faith (not just “I value Christianity” or “I behave like a Christian”) and says “A Christian is who I am… I can be no other” is one prepared for oppression. Christianity needs to translate itself, enculturate itself, into a form that a cultural group can understand and recognize as their own. They also need to be trained and helped to internalize their faith… their lives being the outworking of that faith. Why is this not done? Probably several reasons. Here are a few. A. It is easier to reach out to those that are like ourselves. Homogeneous groups has always been tempting for the church, because it tends to give recognizable short-term results. C. We often practice missions with an “apocalyptic” mindset. That is, we believe that Christ’s return is not only inevitable (a very sound belief) but is coming very soon (a very uncertain belief). The problem with this attitude is that it creates sloppy outreach. We end up focusing on “saying the sinner’s prayer”, baptism, or church membership, rather than on developing individuals, churches, and communities that are deeply internalized in their faith and calling to serve God. We need churches that are built to last. Why does the Church in some parts of the world grow, while in other parts dies? As noted by Dr. Philip Jenkins, author of “The Lost History of Christianity: The Thousand-Year Golden Age of the Church in the Middle East, Africa, and Asia– and How it Died“, we need to develop a Theology of Extinction. This also implies that we need to develop a Theology of Survival as well. Why has the church essentially died in some parts of the world, thrived in other parts, and endured in yet others? Some like to argue that it has to do with persecution. Yet with persecution there is no set agreement. Some would argue that persecution leads to a strong growing church, like China in the 20th century and the Roman Empire during the beginnings of the church. Others point out that persecution leads to extinction, such as in North Africa and Central Asia in the latter parts of the 1st millenium. Some argue that the lack of political (or theological) unity of the church can lead to extinction. The lack of unity certainly hurt during the Crusades in Europe, and during the Mongol Empire in Eastern Asia. On the other hand, in the last two centuries, the church has grown greatly without political unity. Some might argue a spiritual explanation. Churches of sound doctrine or of spiritual fervor will persevere, according to this theory. There seems little good evidence of this. Heterodoxy has a great deal of resiliency. Also, the idea that longevity of a church evidences spiritual vitality begs the question of how this can be demonstrated. Generally the demonstration becomes cyclic… the church must have spiritual vitality because it survived. This “blog” does not seek to answer this question, but evidence the lack of knowledge in this area. Philip Jenkins does point out an interesting comparison… that of Egypt and the North African church. Both regions were overrun by Islamic invaders in the 7th century AD. Both suffered persecution (mild at times, intense at others). Both were profoundly important centers of Christianity before the invasion. Yet each responded very differently. The North African church was mostly destroyed within 50 years of the invasion, and was (as far as can be determined) completely gone by the 12th century. On the other hand, the Egyptian (Coptic) church maintained vitality, size, and relevance in Egypt to this day. While many theories can be given, perhaps the most defensible has to do with the concept of the “Enculturation”. In other words, the question is whether the church ever became a church of the local people. In Egypt, the Coptic Church was definitely the church of the local people. The name “Coptic” even comes from a corruption of the old term for Egypt. The language of the church was the language of the local peoples. On the other hand, the church of North Africa was Latin. That is, the church was mostly of the Roman peoples who settled there rather than of the local peoples. The liturgy and Bible of North Africa was Latin… never being translated into the languages of the local peoples (unlike in Egypt). With the Islamic invasion, the church in North Africa died, to a large extent, because (despite such early church fathers as Augustine, Cyprian, and Tertullian) the church of North Africa was an expatriate church, not a local church. The church fled because North Africa wasn’t its home. This is not a unique example. The Nestorian mission movement of the 1st century had the same problem. It created a string of churches, metropolitans, hospitals, and libraries all along the Silk Road from Antioch to China… but did failed in Central Asia and China to create a church of the local people. It is no surprise that one of the points emphasized by Christian churches in China today is that Christianity is a local (Chinese), not foreign, religion. Lamin Sanneh notes the importance of Translation (adapting Christianity to local cultures) in the mission work of Christianity, rather than Diffusion (forcing cultures to change to a foreign culture). The Jerusalem Council (Acts chapter 15) set the trend. A Greek can be a good Christian without becoming Jewish. Missions today must also follow this pattern or risk repeating the extinctions of the past. The term “evangelism” (“euangelizo”) certainly has gone through many stages in understanding its meaning. The Greek root of this term limits it to “proclamation” or the sharing of news. Within the Christian context, it would cover sharing the good news of Christ to people. However, in its usage in the Bible and in the early church, it appears to have a broader meaning that includes what we often call discipleship. So one could look at Evangelism as a line. That is because it covers sharing God‘s word to unbelievers as well as continued sharing in developing followers of Christ. In more recent times, the term “evangelism” tended to be reduced to a point rather than a line. That is, it tended to be used to describe the work done to create a “conversion experience” in another person. This was often considered to have happened if the recipient said what has come to be known as “the Sinner’s Prayer“. 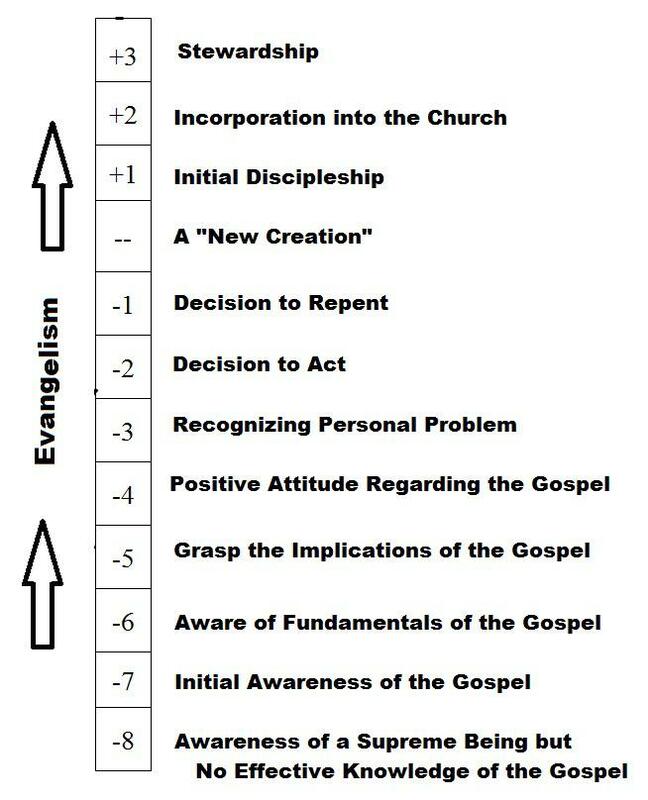 Evangelism has been broadened back to a line by James Engel who created what is now known as the Engel’s Scale. Evangelism is cognitive or proclamation work that moves the listener from a state of rejection towards belief and discipleship. Therefore, helping someone go from complete ignorance of God to understanding who God is in relationship to oneself is part of evangelism. 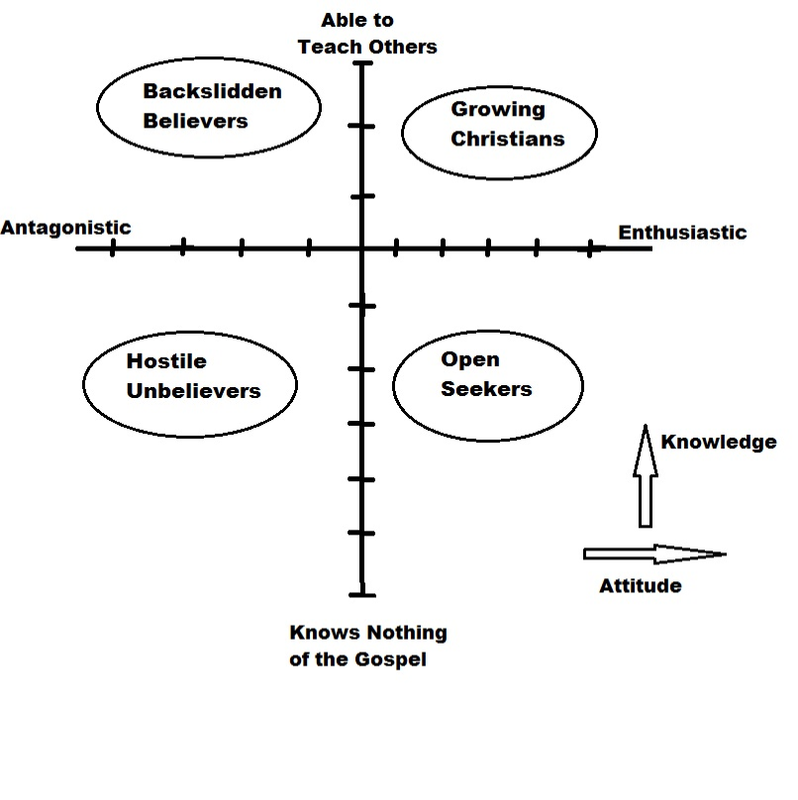 Two-Dimensional Evangelism is found in the Gray Matrix… developed by Frank Gray. He noted that evangelism should not be thought of as simply a cognitive process. There is also an affective (emotions/values) component. This means that helping someone move from hostile to God to having a favorable opinion is also part of evangelism. Moving anyone from the lower left towards the upper right in the 2-D matrix is evangelism. But this begs the question of a third dimension. In education, one generally divides the molding of students in terms of cognitive, affective, and behavioral. Engel’s Scale is cognitive (1-dimensional). Gray’s Matrix is cognitive and affective (2-dimensional). But could evangelism be thought of as 3-Dimensional… or an Evangelism Cube. Could one add a behavioral component. One could argue that salvation does not have a behavioral component since salvation is a matter of faith not works. Yet the same argument might be made regarding the other two dimensions. If it is about faith, it is not about correct thinking or correct affection. But since part of our role as Christians is to be conformed behaviorally to Christ and to guide others in the same direction, then behavior certainly is a component in effective evangelism. Why does this matter… or does it matter? I believe it matters. How we picture things guides how we do things. Some see evangelism as a dot. Get people to say the sinner’s prayer and that is good enough. I have known Christians that have used trickery to get people to mumble the sinner’s prayer. When the person has done this, they feel that they have done the work of an evangelist. It is like a friend of mine who had an interesting experience. Some Muslim neighbors tried to trick him into saying the Shahadah (Islamic statement of faith) three times. Why? Because they believed that the act of saying it three times would make him a Muslim. While we may find that humorous, those that believe that saying the sinner’s prayer makes one a Christian (regardless of intent, heart, or faith) is guilty of the same confusion. Those that see evangelism as a line work with people through the cognitive challenges of faith and continue after a conversion experience towards becoming a faithful servant of God. Those that see evangelism as two-dimensional are also concerned with values and emotions. They are concerned with “decorating the gospel” (Titus 2:10) to not only make it intellectually palatable but desirable to the heart. They share not only what is true, but do it in a way that is kind and helpful (I Peter 3:15). 3-dimensional evangelism is concerned not only with the cognitive side and the affective side, but the behavioral side as well… helping them conform themselves to Christ. Since many behaviors can be destructive and a hindrance, behavioral guidance may begin even before conversion and continue long past. A. Added new files to ARTICLES and PRESENTATIONS. B. Added a PARABLES page. Have two parables put on so far. C. Added a FAVORITE MISSIONS BOOKS/RESOURCES page. Still pretty preliminary. Will do reviews soon on some of these. D. Add a favorite WEBPAGES section. Still need to add more. But what is the fun with a complete blogsite? It seems like it is time to redefine the term missionary. The term has tended to be defined in terms of culture. If one ministers outside of one’s culture (E-2 or E-3) one is a missionary, and one is doing missions. This certainly seems to be the way the Perspectives course does it (this is of course just one example). I don’t think it is wrong to define it that way… but I would like to suggest another way. A. Member Care. Think of a circle with arrows pointing inward. This is any ministry that supports or strengthens those who are already part of the church. Frankly, this is most ministries. B. Church Growth. Think of a circle with arrows going out and looping back in. This is any ministry that is directed outside of the church with the intentional goal of bringing people into that same church. C. Missions. Think of a circle with arrows pointing outward. This is any ministry that is directed outside of the church where the intentional goal is NOT to bring people back into the same church. Such ministry may be directed to people in a totally different community (or culture), directed toward creating a separate church, or simply directed toward to those outside without a clearly defined goal to draw them into the same church. Anyway… this is some food for thought. Consider the following quote by Nick Taylor, pastor of spiritual formation, Coast Hills Community Church, Aliso Viejo, CA. “Why have so many Sundays of Bible teaching produced so few spiritually mature adults?” For all the work that the church has done toward educating adults, we seem to have much less to show for it than one would expect. … For children of all ages, churches tend to offer an incredible array of learning tools and opportunities through which they can discover Christ. Retreats, trips, and events for spiritual growth abound. Meetings are often designed to be interactive and application-oriented. Current issues are addressed, and cultural relevance is a given in all aspects of youth ministry. This charge, directed at Sunday School classes, is equally valid with cell groups and Bible studies. The problem seems to spring from the fact that common models of Church discipleship is “cognitive”… focused on right thinking. Since spirituality is integrated… involving our whole being, it seems obvious that spiritual discipleship should be equally integrated. While small groups, such as Sunday School, cell groups, and Bible studies, seems to be an important component for spiritual growth, it is possible that churches have focused on the wrong types of small groups for adults. Yes. Some of the above groups overlap. That is okay. The point is that groups should not be unbalanced in their discipleship, and they should not be based on models that tend to gravitate towards being unbalanced. Why is this post titled “Discipleship. Time for something new (and old)”? Because Jesus used an integrative apprenticeship form of discipleship. Barnabbas did as well. This is not something new, strictly speaking. Just new to us. If you check out the PRESENTATIONS page on this blogsite, you will see the first presentation is “Integrative Steps of Learning”. This shows how education, particularly in the church can be done differently.